Stauprimide is known to prime Embryonic Stem Cells (ESC) by targeting the c-Myc-activating transcription factor NME2. Its mechanism of action is linked to the inhibition of the nuclear localization of NME2 leading to the downregulation of the transcription of the c-myc oncogene. Patient-derived tumour organoids (mini colon tumours). In blue: cellular nuclei; in red: cellular membranes (Image: Alexandre Calon, IRB Barcelona). 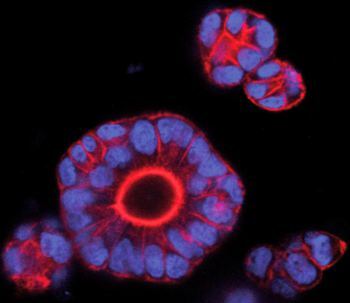 Researchers at the IRB in Barcelona have found a signature of 4-6 genes able to predict the aggressivity of colon tumours, by analysing the tissue surrounding the tumour cells. The scientists are currently developing a test that enables the identification of patients at risk of relapse after surgical removal of the tumour by measuring these found genes. They also propose to test in patients a particular drug that blocks the metastatic capacity of colorectal cancers in mice. This drug has been already tested using organoids derived from patients’ samples. Discovery of the genetic fingerprint of aggressive colon tumours – IRB Scientific news. Calon A et al. “Stromal gene expression defines poor-prognosis subtypes in colorectal cancer” (2015) Nat Genet Apr;47(4):320-9. DOI: 10.1038/ng.3225. On a more funny note, have a look at the video done this last summer by researchers at the IRB Barcelona! Any exciting research (or videos!) done over at your laboratory or institute? When it comes to the body’s natural defenses, is it possible to have “too much of a good thing”? Absolutely. To spare the host, the immune system needs to distinguish it from the real enemy –infectious agents. Autoimmune disorders occur when this recognition frays and the body’s own cells and tissues are damaged. The nucleosome core particle is the fundamental structural unit of the eukaryotic genome. It consists of a histone octamer composed of two H2A-H2B dimers and a H3-H4 tetramer wrapped by ~146 base pairs of DNA. A linker histone (i.e., H1) associates with the nucleosomal dyad as well as with linker DNA on either side of the nucleosome, resulting in the formation of the chromatosome. All the core and linker histones are posttranslationally decorated, with at least 160 total modifications described to date including acetylation, methylation, phosphorylation, propionylation, citrullination, formylation, proline isomerization, butyrylation, ADP ribosylation, ubiquitylation, sumoylation, and the more recently identified glycosylation and crotonylation. 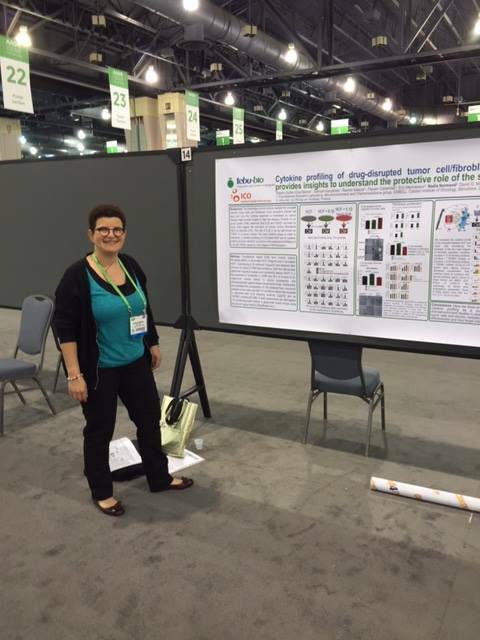 Research performed by David García-Molleví and his team at ICO (Barcelona, Spain), in cooperation with tebu- bio laboratories, is being presented at the AACR congress in Philadelphia these days. The poster describes how cytokine profiling of drug-disrupted tumour cell / fibroblast crosstalk provides insights to understand the protective role of the stroma. Briefly, an array including 174 cytokines was performed on tumour cell / fibroblast co-cultures. Results determine that IL1b and TGFb1 secreted by tumor cells trigger the activation of normal colonic fibroblasts (NCF) to become CAFs. The role of IL1b is not as well known as TGFb1 in a cancer context. ii) profiling of tumor cell-NCF cocultures in the presence of inhibitors of IL1b and TGFb1 signaling, main triggers of NCFactivation. This poster shows how cytokine profiling can be useful as a complementary approach for microenvironment studies in assessing reciprocal activation of tumour cells and stroma, mediators of such interplay, treatment effectiveness and new target interventions. Would you like to have a copy of this poster? Contact us!